Imagine some obscure bar. Imagine light bulbs going back and forth above tables filled with empty glasses. Imagine men with perfect haircuts begging beautiful women for a long, sensuous dance, and end up with Room Eleven. Or, with as much ease, imagine that final holiday night in which seductive glances have their last shot and a lonely mosquito gets lost in the blazing campfire. The list of atmospheric sketches one can come up with is endless, but as long as they sway back and forth between melancholic, summery, seductive and fiery, they are accurate. It will be no surprise that the band’s debut album became platinum almost overnight. Room Eleven won an Essent award for young musical talent and continued their success story with amazing performances on the stages of North Sea Jazz, Crossing Border, Oerol and the Canadian Montreal Jazz Festival, followed by an intimate theatre tour with Jazz Impuls, a fully sold-out Dutch club tour and, after the urgent requests of many local MySpace fans, a great number of shows in Japan. Soon, the band started working on their second album. With the same casualness with which she put that note on the notice board years before, singer Janne Schra sent an e-mail to her hero Dayna Kurtz in New York with a question that was both bold and straightforward: would she be interested in recording a duet? Weeks went by, but in the end the answer Janne had been dreaming about popped up in her mailbox: yes, she would. And if that was not enough, Kurtz also invited the rest of the band to come to New York. Much to everyone’s surprise, Dayna Kurtz offered to help the band record their new album with her regular producer Randy Crafton at the Kaleidoscope Sound Studios. Barely aware of their sudden windfall, Room Eleven immediately began packing their bags. In those few weeks in New York, the band wrote and recorded an album that picks up where the first one left off. It’s more profound, more in the direction of the band’s original sources of inspiration, with a dash of folk and a pinch of gipsy, but maintaining their pure and natural sound. The band truly loathes overproduction; they’d rather go for raw simplicity instead. Hence the title: whereas the first album Six White Russians And A Pink Pussycat referred to a mysterious, sophisticated cocktail, the name of the new album Mmm…Gumbo? refers to a hearty, traditional stew from the home of jazz, Louisiana. 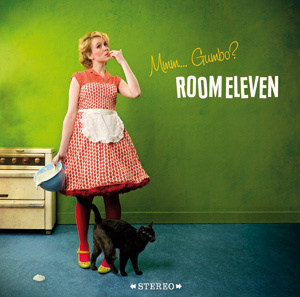 The particular mixture of ingredients reflects the band’s versatility and underlines Room Eleven’s refusal to be narrow-minded. They look at the world around them and take what they can use, whether it’s an instrument, a musical genre or a random observation. Even the loneliest detail can be transformed into a lyric.